What level of legal protection, if any, should be allocated to inventions falling below the conventional criteria for patentability, also known as sub-patentable inventions, in order to best stimulate innovation? This is the central research question which is pursued by in the publication “Innovation without Patents – Harnessing the Creative Spirit in a Diverse World.” This question involves a balancing exercise between the need to incentivise research through offering legal protection and the need for a large public domain to encourage innovation which may be restricted by excessive protections. This work provides an international comparative study of the empirical findings on the operation of various systems of protection for sub-patentable inventions in a number of regions throughout the world. The central research question is considered in a holistic manner, involving a discussion of the economic, industry specific and legal factors which should be taken into account by governments, especially those of developing countries when deciding on what protections, if any to adopt. This task is a difficult one, as noted in the foreword written by Prof. Llewelyn, and it quickly becomes apparent that there is no ‘one size fits all’ solution in relation to the legal protection for sub-patentable inventions to best stimulate innovation. Instead, one of the central tenets of the text is that the success of types of legal protection varies from country to country and is perhaps also dependent on specific business sectors. The analysis unfolds in the book over eleven chapters which are sub-divided into three parts. Part one comprises of four chapters co-authored by Uma Suthersansen and Graham Dutfield. 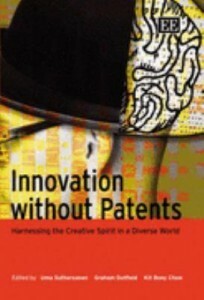 This section outlines the theoretical framework which sets the scene for a thorough discussion of this central research question by examining the rationales for and against offering legal protection to sub-patentable inventions, highlighting the dilemma that some imitation may be necessary for innovation. The legal protections of sub-patentable inventions, including, Utility Models (UMs) or second tier patent systems, design laws, unfair competition and sui generis laws, are assessed and a series of policy considerations which governments should take into account in deciding on the form of protection, if any, to adopt are outlined. Following on from this, part two, comprises of six chapters written by a number of contributors, each of which analyses the protection offered for sub-patentable inventions in a specific area. These areas are; Singapore, Australia, Japan and South Korea, China and Taiwan, the ASEAN states (this focusses on ASEAN States which have a UM, specifically, Malaysia, Vietnam, Thailand, Indonesia, Philippines and Cambodia and does not consider Singapore, which does not have a UM system, in detail again) and Latin America, respectively. Finally, part three, entitled ‘diverse paths to innovative futures’, consists of one chapter which offers a series of conclusions and recommendations for developing countries to consider when deciding on what, if any, legal protection of sub-patentable inventions should be adopted. The text commences with a discussion of development and how this interlinks with innovation. It is explained that the stage of development of a country is a factor which must be considered in deciding how to foster innovation therein as often innovation is often not lacking in developing countries but harnessing it may be a challenge. Two different classifications of innovation are described, namely, ‘discrete’ innovation which involves producing inventions independent of previous innovation, or cumulative innovation which is based on multiple small steps, developing on from previous innovation. It is this latter type of innovation which is most common, as creation does not occur in a vacuum. This gives rise to one of the recurring question of the text, which is whether and to what extent innovation requires freedom to imitate? Three different approaches in relation to the legal protection of sub-patentable inventions can be adopted by developing countries, as identified by Suthersanen and Dutfield, namely; the status quo approach where developing countries maintain the current position choosing not to introduce any new rights; the accretion approach, whereby the developing country may extend or adjust its intellectual property system without introducing any new rights to encompass protection for minor inventions; and the emulation approach, which involves the creation of new hybrid rights, of which UMs are an example. Much of the text is devoted to examining the use of UMs as a device to protect sub-patentable inventions and whether UMs stimulate innovation. This latter question is assessed by analysing the empirical evidence in selected countries which have adopted such systems. Utility Model is a generic term which, according to the contributors, refers to subject matter which ‘hinges precariously’ between that protected under patent law and sui generis design law. Nonetheless, relatively little consensus surrounds the meaning of the term, much less the criteria required to invoke it or the scope of protection which it offers. Generally, however, it is used to refer to a second tier patent system which offers a cheap, quick, non-examination protection regime (although there are exceptions to this) for inventions which would not meet the criteria under patent law. Approximately, 70 countries globally provide a UM protection, however, larger more advanced economies which do not offer a UM protection include the United States, the United Kingdom and Canada. It is argued that even if one decides on the necessity of UM protection, there is still a need to assess the type and extent of UM protection which should be granted. Current UM systems differ considerably with the three main points of divergences amongst the current worldwide UM systems, being; the subject matter which is protected, the granting procedure and the substantive criteria. The UM system can offer a lower cost regime of protection for sub-patentable inventions, however, it is suggested that the perception of UM systems varies amongst industries with some being suspicious of UMs as stifling industrial access to a large public domain and ‘creative imitation’. Therefore, it is argued that one needs to know the extent to which copying is a problem in different industries and whether inventions in some contexts are best left in the public domain. Furthermore, in order to consider the practical advantages of UM protection an understanding of how firms compete in an innovative environment is necessary. Why UMs are perceived as being particularly useful for small and medium sized firms (SMEs) is also discussed. This analysis is followed by a summary of the benefits and costs of UMs and the fundamental problems of using UMs as a policy tool to protect sub-patentable inventions. A clear analysis of the other forms of protections which could be used to protect sub-patentable inventions, specifically, design laws, unfair competition law and sui generis laws is then offered. This analysis concludes by looking at the United States’ system which does not offer a second tier system of protection. It is argued that such a system may be unnecessary there given the relaxed nature of the current patent system requirements which offer protection to minor innovations. The examination of the United States should perhaps have been the subject of a separate chapter delving into its system in further detail, especially as the text concludes by recommending that developing countries emulate the approach of it and Japan. Following on from this, part two which is comprised of chapters five to ten employs six case studies which offer a practical rounded analysis, examining the intellectual property frameworks, innovation environments and economies of each of the regions concerned, whilst maintaining a central focus on the level of legal protection offered to sub-patentable innovations, in particular, looking at the statistics on UMs where present and assessing whether the presence or absence of such systems effects the innovative environment in a country. The study of Singapore in chapter five is useful as it does not have a second tier patent system, so the primary focus is whether Singapore would benefit from one. Each of the other countries examined have a second tier patent system, although it is not always referred to as a UM. These chapters give an insight into the empirical findings on how the second tier system operates in practice, who the main users and beneficiaries are and whether such a system aids innovation. The examination conducted is thorough, in particular, in the case of chapter five which offers the most detailed examination. In this chapter, the authors reflect on the study of Singapore undertaken under the aegis of the Singapore Intellectual Property Academy which provided empirical evidence to ascertain if Singapore should adopt a UM regime. This study employed three empirically based approaches, namely, a national survey of the innovation being carried out in Singapore assessing what type of innovation is carried out and by whom; a targeted survey which focussed on 104 firms from manufacturing and service industries to ascertain their levels of innovation and views on introducing a second tier patent system and; finally, a case study approach which involved conducting face to face interviews with three innovative firms operating in different sectors in Singapore. The authors present a detailed account of the findings utilising a series of graphs and tables to illustrate key figures and statistics. The result is a comprehensive overview of the Singaporean economy and business needs to assess whether a UM system would be beneficial to Singapore. This analysis includes an assessment of the level of patent applications in Singapore, the views and practices of small and medium local enterprises (SMEs), whether the majority of innovation being conducted is by foreign or domestic companies and the industries view on the need for a UM regime. The chapter concludes noting that whilst 95.2 percent of the respondents to the study stated there was a need for a cheaper, faster protection regime to encourage innovation in Singapore, however, there is also a perceived view by industry of the need for a large public domain to encourage incremental innovation which necessitates the absence of a UM system or at least a weak UM system. The authors caution that if minor innovations are to be protected then, a UM system is not only way to do this and if a UM system is to be introduced, justifications must be offered as to why it would serve the needs of industry better than alternatives such as an expansion of the patent or design laws. The remaining case studies, which as noted deal with countries which have a second tier patent system, are equally insightful; however, the study of Latin America is quite sparse and could have been more detailed. Overall, the studies suggest that UM regimes have varying success dependant on the specific characteristics of the country which they are employed in. The book provides a rounded analysis of the complex issues which arise for countries in deciding the level of protection for sub-patentable inventions. The use of empirical studies offers a fascinating insight into the delicate interplay of economic forces, industry and law in this area and highlights the cumulative impact which these forces have on the innovation in a country. In short, it is a highly recommended read. ← Law Meets Biology: Are Our Databases Eligible For Legal Protection?